When my kids were little, crossing the Bourne Bridge meant counting the bridge lights and looking for boats in the canal. To me, crossing the bridge and arriving on the Cape meant that my shoulders finally unattached themselves from my ears, and the muscles in my neck relaxed. I know that geography shouldn’t determine my attitude or disposition, but the Cape does. It slows me down and allows me to see what I often miss in my standard busyness. I’ll have a leisurely second cup of coffee in the morning and wait two weeks before changing the bed linens. I enjoy the imperfections in my daily routine instead of clutching and fretting over them. There are weeds on my front yard; some of them have really pretty flowers. My dinner plates are purposely mismatched, all somewhat white, all different shapes. I don’t plan my meals ahead of time; I go to the fish market and ask them what I shouldn’t leave without buying. They never steer me wrong. And I do eat the most outrageously delicious bread pudding with whiskey sauce at Pie in The Sky, and I don’t care if it’s realllllllly off my paleo/no carb/no sugar diet. Before I go to sleep, I take a quick look at the night sky from our deck. There are no streetlights, no city beams to disturb this universe. I finally know which way is north, south, east and west—something I’ve never managed to learn in suburbia. The peepers croak the weirdest tunes that make me smile—I know what they’re doing. And every once in a while I’ll get up early enough to hear the bird chorus; it starts off with a single voice, reaches a delightful group crescendo, and then tamps down to a tweet. The best kind of tweet in the world is not limited by 144 characters, and I appreciate it here at the Cape. There is something about living near the sea. The winds are stronger. The thunder rattles my bones. Trees are gnarly, and rocks are more abundant. The combination of sun and sand heals everything. It’s brighter, darker and on the edge. I love it. I just bought four pairs of really comfortable shoes so that I can take a walk any time, any place, no matter what’s on my feet. I’m no shoe fashionista, not by a long shot, but it is giving me an unusual amount of pleasure to be able to purchase shoes that make my feet happy and don’t look ugly. I test drove one pair yesterday on our forty-minute afternoon walk and landed home with no blisters, no red marks and no sore feet. Yes!!!! This is the way to travel on foot. I remember my years as a businesswoman when the “uniform” required high heels. Every morning I’d don a 2” to 2.5” heel and start my day. I never questioned the awkwardness of driving in heels and never had the smarts to kick off the shoes while behind the wheel. For several years my office was in Faneuil Hall, and I hobbled over the cobblestones on a regular basis. The uneven surface did a job on my ankles, my back, and on my shoes, but flats were never an option. They just didn’t fit the prescription for a professional woman. Now I think, how silly was that?!? I still have more high heels than I can count, and none of them have been worn in years. I think that’s progress. What pleases me most is that I now consider my daily walks part of my essential routine. It’s non-negotiable that I’m able to walk on a whim. No, I’m not jogging or even power walking; I’m just taking a fast enough walk to build up a sweat and take in the world around me. It clears my head, and makes me happy, feet and all. It’s starting to feel like that time of year… when classes are over and summer begins. When I was growing up, on the last day of school, before we left to summer in a little cabin on Lake Champlain, my parents would take me to a small, independent bookstore in Basking Ridge. It was there that I was permitted to pick out the number of books equal to my age plus one. As a ten year old, I filled a tote bag with eleven books of my own choosing. It was marvelous! There was no parental intervention, no pressure, no requirements; it truly was self-selected reading. So every summer started off with a big pile of wonderfully delicious books. It was money well spent by my parents. This tradition left its watermark on my brain. My husband and I continued this routine with both of our daughters. Each daughter would roam through the book stacks in search of something interesting. I learned to keep my mouth shut and offer no suggestions. It was difficult. Once Molly picked out a book simply because she liked the cover. I was mortified until I learned that many customers do the same, and the book she selected by its cover ended up to be one of her all time favorites. It’s still on her bookshelf ten years later. Once Kate chose an assortment of graphic novels; I was astounded… comic books????? She pushed me to read one before I passed judgment. That’s how I got hooked and ended up creating a college course on the canons of graphic novels. Maus, Persepolis, A Contract With God, Watchmen, City of Glass, Caricature Nine Stories became my new favorites—and those of many of my students as well. The combination of art and text allows the writer/artist to express imagination in an extra dimension: a step beyond tradition and conventions. As our girls get older (now 20 and 27) I still make the offer to go to the bookstore with them… or have them scout out what they like on line. Yes, the 20 year old is entitled to 21 books and the 27 year old has rights to 28 books. They seldom take me up on my offer right away…but often times, a week or two later, we find ourselves in a bookstore together, and the tradition continues, although somewhat morphed and abbreviated. I find that I, too, collect a pile of books for summer reading. Unwittingly, my lack of moderation accounts for the continued practice of my age plus one. There are at least 60 books stashed high and deep, waiting for me at the Cape. I try to arrange them in some kind of reading order, but that’s a useless adventure. I will read them all, and more… but the order remains uncertain and up to serendipity. I’m just starting Falling Man by Dom DeLillo and, after a HUGE discussion at book group, Hunger Games is on my list. My rule of thumb is that I read up to page thirty, and if it doesn’t make my heart or my brain go pitter/patter, I drop it like a bad boyfriend. That’s the rule. So many good books, so little time. Posted in read. Bookmark the permalink. Even though I’ve always been addicted to words, sentences, and paragraphs, I’ve also been drawn to science and wonderful “nerdiness”. My dad worked at Bell Labs while I was growing up and came home with great adventurous tales of the evil Sputnik, the fabulous Telstar, cathode ray tubes, lasers and product testing telephone poles. Fast forward a few years, and I find myself marrying a physicist at MIT who continued my science adventures with questions from Part One of the doctoral exam (Why is the sky blue?) 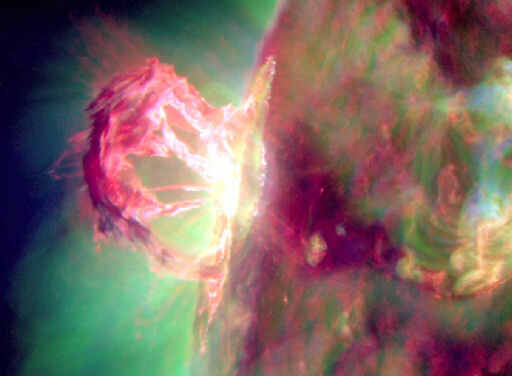 and a whole new world of wonders: fusion, the aurora, chaos theory, string theory (not yarn! ), complex systems and more. I don’t pretend to understand all of our physics discussions and have been known to say: “Do you know how you can spot a physics joke? –It’s not funny.” I do understand these matters and anti-matters better when analogies and metaphors are used. Food analogies work best. We have always celebrated Einstein’s birthday (March 14), and Richard Feynman is a hero to both of us. Our daughters went to the Children’s School of Science in Woods Hole during the summer and learned science with a “hands on” approach. They still talk about their exciting experiences years later and want CSS t-shirts for Christmas. They use their science skills at work and keep it alive in their heads. So science has woven its way into our life. I especially like how it has influenced my critical thinking and teaching strategies. I used the “scientific method” as a way to teach problem solving and essay writing in my college classroom. This approach demands that one looks at an abundance of evidence from multiple perspectives and not prejudge and pre-pick the easy, obvious stuff. It calls for embracing ambiguity and pushing beyond one’s comfort zone. It means having the courage to say “no” to arguments that turn out to be not worthy—and walking away from pat answers while searching for something meaningful. It means not throwing your body at the first idea that pops into your head; if I said that once, I said that a million times to my students. It means not being afraid to explore. So after all of these years, I realize that it’s the exploration that excites me; it’s whether I’m discovering meaning in one of Shakespeare’s sonnets or the new, first novel The Tiger’s Wife by Téa Obreht or trying to figure out the unintended consequences of consumerism or what is really going on in the night sky or how to make a great chocolate cake that rises without eggs. It’s all the same process; it’s really not something different. Some folks can track their lives through the books that they’ve read, the songs they’ve heard, or the graduations they’ve attended. Personally, I find it incredibly meaningful to look at my life via the socks on my feet. As a seven year old, I wore a school uniform, right down to the toes. White cotton ankle socks—no lace—no trim—bleached dead white. Nothing less was accepted and nothing less was ever worn, even if it meant washing out a pair the night before class and hanging them in the bathroom to dry. During the school day, these white socks purposely slid into our shoes and caused misery and anxiety. In late fall, the rules changed to a more seasonable grey knee high. These kneehighs had to “stay up”, no slouching allowed, just like our posture in class. Everything was at attention. I confess that we used rubber bands in order to keep on the good side of the administration who never seemed to hear of the words “phlebitis” or “tourniquet”. In high school, if you were cool, you wore NO socks. Our mothers vehemently protested. “You’ll catch a death of a cold!” It’s not like we weren’t wearing bras or going commando…. Nevertheless, we learned to leave the house with socks afoot, and then clandestinely stuff them in our pocket (or bra) before arriving at school. Mother never knew. At college in New England, the coolness of no socks turned into very cold feet. I learned to don not one, but two pairs of socks from November through late March. Shoes were bought a size larger to accommodate my thermal layers, and items from head to toe seldom matched. I was studious, warm and not fashionable. After graduation, the work place had entirely new demands on my feet. As a teacher, I wore grown up clothes and grown up hose. Pantyhose, to be exact. What a stupid invention! I can guarantee you that no woman invented pantyhose. I learned to struggle with runs and sagging hose in the ankles as well as the tummy slip and slide. The waistband never stayed put. Elastic bands would be of no use. For many years, my sock drawer became my pantyhose drawer with fancy sub-dividers. They were not necessarily happy years. 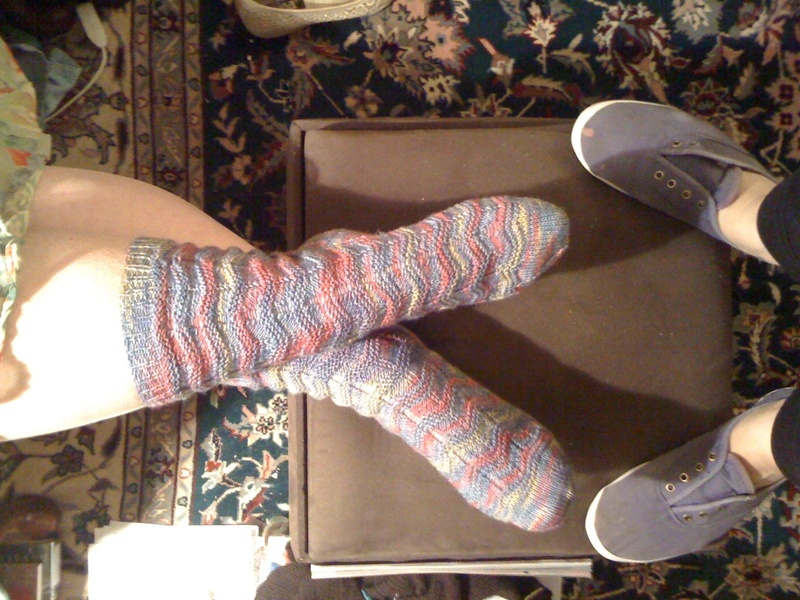 Two years ago I learned how to knit socks. A whole new world opened up for my toes and my soul. The first several pairs were misshaped, too big in the foot, too tight on the top, and I absolutely loved them. Making socks for me is one of the nicest things I do for myself. Sock knitting offers fun yarns and excitement… something to look forward to at every step of the way: ribbing, leg pattern, heel patch, gusset, foot, kitchener stitch. When my younger daughter left home to go to college and venture out into the world, she asked me for only one thing: Mom-made socks, as many pairs as I could knit. Wow- I thought- she sure is ahead of the sock-learning curve. She left with five pairs of socks that actually fit her and a standing order for more. One of the best things she ever said to me was “Every morning, when I get dressed and put on my socks, I think of you, Mom.” That was a puddle moment! I’ve made a decision, at age 59, to only wear socks I’ve knitted. No more commercially made, skinny, skimpy, anemic, machine made socks. I’ve already created twenty pairs and am on the way to knitting one new pair a month. Wearing hand knit socks is like giving your feet a hug and a massage at the same time. Best of all, I love the instant smile that comes to my face when my pant leg happens to ride up and my bubble gum pink striped beauties wink at me. Life is good. Hand made socks are great. Just do it! I can’t wait to tell you what my socks reveal about the next year of my life. I’ve just retired, and my sock yarn stash is taller than I am. Posted in knit. Bookmark the permalink. Father Bill’s/Mainspring is an extraordinary non-profit/non-denominational organization whose mission is to end homelessness. It is both smart and compassionate, and truly makes a difference in people’s lives. I’ve been working with FBMS for six or seven years and am constantly impressed at how the organization teaches folks “how to fish” and doesn’t just throw them a can of tuna. This is evident in all of the programs that are offered to those who seek shelter or a meal. Two emergency shelters (in Quincy and Brockton) are the way many homeless men,women children seek refuge AND also find strategies to end their homelessness. They’re portals to better options. While providing the emergency services, FBMS offers medical and behavior support services as well as job training. Today I was at the Brockton facility and saw the Work Express team in action; these formerly homeless people are gainfully employed, earning money and learning life skills and job training. They no longer live on the street. Two new multifamily houses are being renovated and will soon be home to six previously homeless families. The Spring St Residences. in Brockton as well as a new facility in Hingham houses previously homeless veterans. FBMS does it right; I wish more organizations would follow their lead. FBMS is a gateway to a better life and it’s working. How To Keep Your Volkswagen Alive by Christopher Boucher is one of the most imaginative, interesting and captivating books I’ve read in a very long time. The plot focuses on the relationship between a father and his son; the son happens to be a VW—yes, that’s right, a beetle car. That would normally be quite disorienting, but after ten pages, I was hooked and worrying about the son’s diet. Boucher is a clever wordsmith who takes storytelling to the next level. The word play, unexpected developments and mix of reality and absurdity sent me flying throughout this book. I could not put it down and am still thinking about it a month later. I wrote to Boucher and told him I needed more of his writing asap… he’s working on novel #2 and I can hardly wait. Posted in read and tagged read. Bookmark the permalink.